Japanese Episode AG 036: "Umi no Hakubutsukan! MAGUMA-Dan no Shuugeki!!" American Episode 308: "The Spheal of Approval"
Now that the Kaina City Pokemon Contest is over, Satoshi-tachi take the time out to take in the city. Takeshi and Haruka go off shopping while Satoshi and Masato go to the Marine Museum. However, the museum's doors are locked, and Satoshi and Masato can't get in! Suddenly, the two are approached by a young boy named Yousuke and his Tamazarashi. The boy attacks the two, thinking they're thieves, until Satoshi and Masato get a chance to explain themselves. Suddenly, Kusunoki-Kanchou, the curator of the museum, appears and explains that the museum was closed because he had to go out and take care of some business. He invites everyone inside, where he shows Satoshi-tachi a black rock that may be linked to the legendary pokemon Groudon. While Satoshi, Masato, and Yousuke are drawn outside by the Rocket-Dan selling sno-cones, members of the Magma-Dan overtake Kusunoki-Kanchou and steal the black rock. Satoshi-tachi find out about their plot and attempt to stop them, but after a long struggle the Magma-Dan members are able to get away with the rock. Luckily, a piece of the rock breaks off during the battle, so Kusunoki-Kanchou is still able to analyze it. Satoshi-tachi, having finished their business in Kaina City, announce that they're on their way to Kinsetsu City to challenge the next gym. One word describes this episode--"meh." The episode was just uninteresting; Yousuke felt like a Jouto character-of-the-day reject, the "I'm a beginning trainer who doesn't know anything about anything" thing has been done to death, and the Magma-Dan just wasn't as cool as they usually are. The only thing saving this episode from being placed in the dreaded "filler pile" is that it features a place from the games. For the dub, there's only two time cuts, so there's nothing too big to report. The middle commercial break in the dub comes waaay early. 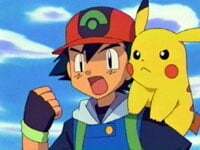 Originally, it doesn't occur until after Pikachu jumps into Satoshi's arms after it's freed from the Rocket-Dan's cage. In Japan, they showed the part where Satoshi looks at the Magma-Dan and identifies them before the show goes to commercial, and then shows the same clips (in a slightly different order) after the commercial break. For the dub, 4Kids took out the five seconds before the Japanese commercial break, and then another four seconds right after the commercial break. You still see the exact same footage that they saw in Japan; the only difference is that you only see it once, while Japanese audiences saw the same footage twice. The pan shot right after the final commercial break is shortened by two seconds.